Every narrative film is, in a sense, a thought experiment. Every plot is a "what if". The way the characters behave and interact, the decisions they make, the consequences that ensue, and the backdrop against which it all occurs, are strands which together comprise a hypothesis about how things would or could unfold if x, y, and z were the case. They are in that sense elements of a theory about how the world works, although very few films explicitly set out to explore specific futures in a plausible way. I am a longtime moviegoer and sometime filmmaker, and have for years been especially interested in the way the future is depicted in film (at one point co-writing an article on the subject). This medium is our most powerful mechanism for broadcasting pre-imagined scenarios. It's far more vivid, detailed and accessible -- to audience members, not to producers -- than literature. There's a case to be made for comics, or, to use Will Eisner's term, "sequential art"; but that's a topic for another time. The point here is simply that the way film, or more accurately, audio-visual scenarios (let's not exclude television), provide a reference point for future-oriented discourse is important, from a futurist's perspective. 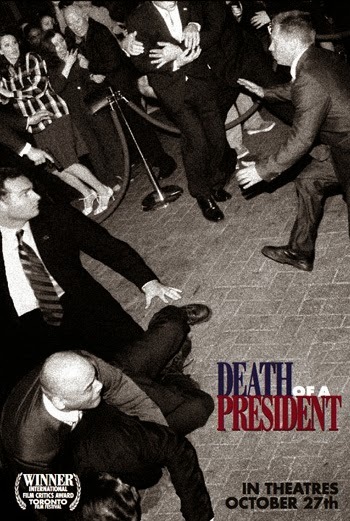 On Thursday night I saw Death of a President, a feature-length film which ingeniously uses documentary technique to imagine the assassination of US President George W. Bush -- next year -- by a sniper in Chicago. Despite mixed reviews, in the US, at least -- for two different aggregations of critics' responses check out Rotten Tomatoes (33% positive reviews) and Metacritic (average score 49/100) -- I found it quite effective and very interesting, and, appropriately, difficult to pin down ideologically. I say appropriately because a truly effective scenario laid out in this way ought not to be a partisan matter, and although it will inevitably reflect or embody a theory about how (some specific aspect of) the world works, it must ring true in its reflection of different participants' perspectives on the events, whatever they might be. We may return to the critical reception of the film as the subject of a future post, but for the time being, let's take a look at the medium -- which we'll call the future documentary; documentary film as artifact from the future. D.O.A.P. is not unprecedented as a future documentary. The first such feature that I recall coming across was made by a London-based company named Wall To Wall, and screened by the BBC. It was called Smallpox 2002: Silent Weapon (02002), the story of a devastating international terrorist attack perpetrated with the smallpox virus. The filmmakers were eerie in their timing -- while the film was being made (from February '01 through January '02) both 9/11 and the US anthrax attacks occurred. Its impact on the viewer had a lot to do with the documentary approach to fictional material: the story was put together in a highly plausible news-doco style, and narrated as if the viewer were now in 02003, looking back on a global tragedy, counting tens of millions of lives lost, that had unfolded late in '02. The friend who alerted me to the existence of this film had stumbled across it that year on cable TV in Serbia, and had watched in horror, transfixed, until it sank in that this had to be merely a hypothetical storyline. The director, Daniel Percival, later made Dirty War (02004) for British television, a topical drama about a nuclear device being detonated in central London. The director of Death of a President, Gabriel Range, has himself made two other films using a similar format, The Day Britain Stopped (02003) and The Man Who Broke Britain (02004). Both were made through the same production house as Smallpox 2002, but neither, for obvious reasons, was fated to make a major international impact. And although there has been a recent spate of British film and TV productions using documentary to depict futures (including the excellent BBC series If... referred to in a recent post at this very blog), it goes back further than that. English director Mick Jackson made the 01984 film Threads, and in 01988, the TV drama series A Very British Coup, also a politically themed "what if" (though the latter was not, I think, in documentary format -- I haven't seen that one). Earlier still, perhaps the founding exploration of a future scenario in documentary format, is The War Game (01965), by maverick documentarist Peter Watkins, which used the newsreel-style documentary footage of the era to present a chilling vision of what a nuclear attack on Great Britain might be like. Although, like Smallpox 2002, it was produced for the BBC, the film was banned from British television -- ostensibly (according to the director's own account) on the grounds of artistic failure. The ban was not lifted for some twenty years, and Watkins relates an intriguing, even scandalous, story about the intensely political fate of this film. Yet it is, emphatically, anything but an artistic failure: it is an underappreciated landmark in filmmaking, which still packs an emotional punch after forty years. In fact it won an Academy Award in 1967 for Best Documentary Feature. What was that? Yes, Best Documentary Feature: a fictional film about a hypothetical nuclear attack. Now, I have written in this setting about what I see as a need for futurists to design and communicate scenarios in more engaging ways. Examples include the immersive futures workshops designed for "Hawaii 2050"; the idea of gaming alternative futures; and the futures audio tours currently in pre-production. In this vein, the future documentary genre can be used to render hypothetical scenarios more vivid, and I suspect (though it would take more research to prove) that the quality of conversation which ensues makes it a valuable exercise. But we can reasonably contemplate why the documentary format invites a particular, and particularly useful, kind of discussion. Death of a President is a much less violent film than any of the four mentioned above. Its story does revolve around a shooting, but it doesn't dwell on the act itself, and certainly could not be said to fetishise gun violence -- which is merely a vector for telling another story, about how such an event can be used opportunistically to advance domestic and international political agendas. While there is a certain amount of dramatic mileage squeezed out of the lead-up to Bush being shot, from a filmmaking point of view it's necessary scene-setting that shows how and why such a consequential security breach could have been allowed to occur. The moment of the crime itself, when it comes, is all handheld, shaky camerawork, deliberately chaotic and close to being visually incomprehensible. The most interesting part of the film comes afterwards, when the plot thickens with a series of suspects being examined, and a sort of documentary whodunit unfolds. Now, John Gaeta, the man behind the Matrix special effects, has spoken of that movie's "bullet time" effect as heralding a new development in filmmaking, the "virtual camera". But every narrative film -- where, courtesy of actors trained to ignore the camera in the room, we're privy to the most private parts of characters' lives -- is, in a sense, shot with a virtual camera. It's like the omniscient narrator of a novel, who can guide us at will inside thoughts and motivations of characters who would, if they were real people, be at a loss to explain themselves. In other words, these devices enable a type of intimacy which in turn makes it possible to tell the story. And both types of storytelling require our complicity, in agreeing to the invisibility of the storyteller. The bargain is that, when the ploy works, we get to see deeper inside the human condition. Though at one level it's a bigger lie, the payoff in terms of human truth can also be bigger. Unlike most fictional narratives, Death of a President is not meant to be a novelistic meditation on the human condition. It may all be fiction, but virtual cameras are eschewed in favour of virtual realism. In choosing to present this story as a documentary about an unexpected event, by contrast with a "scripted" drama where the camera can be anywhere, the filmmaker's materials are limited to ex post facto piecing together of "fragments", carefully crafted -- interviews, security camera footage, TV news reports, file tapes, and the like. The paradox that arises here is that the fictional documentary ("mockumentary", as in Rob Reiner's seminal comedy This Is Spinal Tap) is, in relation to the story it tells, simultaneously more real -- because presented with the familiar audio-visual conventions, including limitations, attendant on presenting "real" stories -- and less real -- because it's more self-evidently constructed and the seams are harder to ignore. The way I read it, the film asks us to engage with the question of the plausibility and the possible consequences of something like this happening, by presenting it as "real". (How would it feel to see this documentary presented as fact in two years' time?) If the same story were given the Hollywood treatment, and an actor -- say, George Clooney -- were playing George Bush, it's easy to imagine that it would risk either mythologising or trivialising the possibility of presidential assassination. And while I don't think this is necessarily the most important, interesting or relevant topic about which we could be asking "what if? "; as a well-made instance of the future documentary genre, it's not a bad example of how that question can usefully be posed. These films also invite us to recognise, by their skilful use of documentary conventions that appear to frame their content as factual, that every narrator has a position vis-à-vis the tale she tells. As the masterful Swedish writer, Sven Lindqvist, confesses: "Even in the most authentic documentary there is always a fictional person – the person telling the story. I have never created a more fictional character than the researching 'I' in my doctorate, a self that begins in pretended ignorance and then slowly arrives at knowledge, not at all in the fitful, chancy way I myself arrived at it, but step by step, proof by proof, according to the rules." (Exterminate All The Brutes, 01992, p. 104) If we accept this invitation, we should discuss scenarios -- and indeed, any films, novels, political events, products, or anything else worthy of public attention -- in light of a full and frank recognition of our personal investments in them. What's much more interesting than a filmmaker's take on the material is the ecology of opinion that greets it. The great director Billy Wilder said: "If people see a picture of mine and then sit down and talk about it for 15 minutes, that is a very fine reward, I think." There was much more than fifteen minutes' worth of top notch conversational fodder in Death of a President. Maybe films like this should be judged more for the quality of the discussion they inspire than for the viewing experience itself. Now, there's a kicker in all of this, so stay with me just a moment more. The film grabs attention with its premise of the sitting President being killed. Few supposedly secular phenomena come closer to being sacrosanct in America than the office of Commander-In-Chief. But the future documentary format, which appears to have thrived on British screens in the past few years, has apparently not been so popular in the United States. (It's pretty much unthinkable that this British-made film, though set in the US and featuring American actors, could have been financed and made by Americans... but if any readers of this blog would like to draw comparable examples of US-made future documentaries to my attention, that would be very illuminating). The twist here is that Death of a President has been banned by two large American cinema chains: echoes of The War Game in Britain, forty years ago. There's surely no clearer signal that a political film needs to be seen than when it gets banned; a lesson which, one might think, ought not to be lost on fans of the First Amendment. I've suggested that if films can be likened to thought experiments, some very useful results can be expected from future documentaries like these, which are presented as artifacts from their respective possible futures -- so long as we are prepared to entertain an open conversation about the scenarios they propose. When we're refused the chance to see them, it lends a degree of urgency to finding out what all the fuss is about... so look for a screening near you, sit back and watch Death of a President, and then let's have a nice chat. Hi, I was provoked by the "thought experiment" description of film. It does seem that almost any creative pursuit can be classified as a gedanken experiment. In that case, it is not clear if such a description sheds any particular light on film-making that is not at the same time shed on literary fiction, ballet, opera, painting etc. It would seem then that all you are saying is that film-making is "something creative" as creativity necessarily involves a "what if" question. Many thanks for raising an interesting point. If I can qualify my statement, in the light of your helpful observation, it does indeed seem that any story -- but not, I think, any creative endeavour more broadly -- is a thought experiment in the sense I have in mind. Stories depict events unfolding in sequence. Painting, single-panel drawing, sculpture and still photography (for instance) do not have this quality; whereas film and television, stage plays including opera and ballet, and literary fiction do. I make this distinction because story engages a temporal dimension. The "what if" is followed by some kind of answer for our contemplation ("then this would happen"). So, although perhaps not unique in this regard, audio-visual storytelling is in my view uniquely powerful, because it's accessible (meaning easy to absorb), and offers the same story to each viewer, therefore serving as a collective reservoir of "images of the future", with resonance at both conscious and unconscious levels. Small wonder, then, if massive asteroids hitting earth, killer-virus pandemics, and mutant science experiments wreaking havoc on shrieking New Yorkers are scenarios more readily imagined for many of us than ending poverty, peacefully dismantling the world's militaries, or holding a corporation-free summer Olympics in West Africa. The former stories have been imagined for us dozens of times; while these other tales don't typically make it to the multiplexes. The main insight is not the specialness of film per se (as you point out), but as follows: We can regard stories set in the future as thought experiments -- albeit with some fitting that analytical frame better than others -- and talk about them on that basis. How plausible is this future; how organic or contrived? What assumptions underpin the actions of this party, or that one? For whom, and in what ways, might this be a desirable scenario? And what, if anything, might we like to do about it? It seems to me the way our storytelling media are used, and the sorts of images of the future that they offer, and the kind and degree of critical scrutiny they meet (or not) are important indicators of a culture's attitudes towards, and prospects for, "the future". For with images of the future we get back to the bread and butter of futures studies. Consider Fred Polak's The Image of the Future (01973, trans. Elise Boulding). "The general character and quality of the images of the future which prevail in a society" are, says Kenneth Boulding in the foreword, "the most important clue to its overall dynamics. The individual's image of the future is likewise the most significant determinant of his personal behavior." I am suggesting that we need to look carefully at the images of the future we're offered; and when they are withheld, ridiculed or deemed inappropriate, ask why; and ultimately generate and find compelling ways to describe and discuss our own preferred alternatives. We need, in other words, to run many more of our own thought experiments, and then enact the most promising ones in our lives. And not to be too cute about it, but my basic interest is just this: how can we bring futures to life? Back to the original point, then. Creativity does involve a "what if"; so too does inventing a preferred future (it's a question we ask many times over). Filmmaking, to my mind, simply offers one of the best ways to broaden participation in that discussion -- but any way people do it is fine with me. Death of a President: The Ballet could be just the ticket.